If we think of the work of scientists as the pieces of a jigsaw puzzle, then Margaret Leinen is one of the people who put these pieces together. 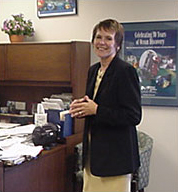 Whether it was helping to organize a large-scale effort to collect and study sediments from the equatorial Pacific, or coordinating research and education as Dean of the Graduate School of Oceanography at the University of Rhode Island, Margaret has always relished the challenge of promoting scientific research by bringing people together and making things work. Now she heads the Geoscience Directorate at the National Science Foundation (NSF), and she has more pieces to work with than ever. Margaret in her office at NSF. As the Assistant Director of Geosciences, Margaret administers the NSF programs in Earth, Atmosphere, and Ocean sciences. She is also in charge of a new interdisciplinary program in environmental research and education where she works with people from such diverse disciplines as biology, chemistry, engineering, and social, behavioral, and economic sciences to fashion environmental research programs. Margaret's main administrative responsibilities are to manage the budget that Congress has allocated and decide which of the many worthy proposals for research projects or new initiatives should be funded. She also works with other federal agencies, such as the National Oceanic and Atmospheric Administration, and with agencies from other countries to coordinate international research projects. Margaret is also geoscience's chief advocate. A big part of her job is convincing an often skeptical Congress that the programs she is administrating are worthwhile. But a greater challenge is enticing new people to pursue careers in geosciences, particularly women and minorities. Currently, women represent only about ten percent of the tenure-track faculty and senior researchers in geoscience departments in universities and oceanographic institutions. And overall, the geosciences lag well behind other fields such as physics and engineering in recruiting minorities. Margaret says that this lack of diversity within the scientific community will cause the field to stagnate. She argues that people of different genders, backgrounds, and cultures bring new perspectives and fresh ways of attacking scientific problems. "The health and the vigor of our science are at stake." Entrance to the Directorate for Geosciences offices at NSF. Margaret does not believe that these underrepresented groups face overt discrimination. Instead, there are far more subtle and complex forces at work. For example, many women receive training in oceanography, yet despite the desire of most institutions to hire more female faculty, few women are applying. Many that do join the research community face difficult challenges balancing family and career and eventually go to other jobs. Somehow, according to Margaret, these universities and research institutions are not providing a climate that is friendly enough to women. As for minorities, Margaret says that society, sometimes in very subtle ways, has often told these groups that the ocean does not belong to them. One not-so-subtle example is that until the sixties, African Americans were excluded from some beaches in the United States. As these minority populations increase over the coming decades, Margaret says that we need to communicate the importance of the ocean and geosciences in their lives and show them that they have a stake in the health of the ocean. Otherwise, they will continue to stay away and science will suffer. Margaret says there are several ways that NSF can reach out to these underrepresented groups. NSF can step up its own efforts to recruit women and minorities to its staff. They can make sure that their grant programs do not present barriers preventing women and minorities from obtaining scientific funding. They can sponsor education programs such as research and mentoring opportunities that encourage women and minority students at all levels to pursue science careers. Finally, they can reach out to the general public at large by sponsoring museum exhibits and other projects such as the IMAX film of hydrothermal vents shot from the submersible ALVIN. Prior to her work as an administrator, Margaret was a successful paleooceanographer. Her focus was the sediments that have been settling on the ocean floor for tens of millions of years. By taking core samples of these sediments and studying their composition and mineralogy, she could help piece together the geological history of the ocean bottom, information on past climates, and even some of the geological processes on the continents. One area she focused on was the history of hydrothermal activity on the deep ocean floor. Hydrothermal vents spew up huge quantities of fine-grained particles into the water column. After drifting around in the currents, these particles eventually settle down. By studying these sediments, Margaret and her colleagues were able to gather clues about how hydrothermal activity has changed over the past tens of millions of years and whether these changes were associated with changes in seafloor spreading and the configuration of the oceans and continents. Her work on hydrothermal vent sediments involved teaming up with other scientists, and she found that she really enjoyed the collaborative part of the research. Later, she helped organize seven cruises to the equatorial Pacific involving 70 principal investigators as part of the Joint Global Ocean Flux Study—a massive program to collect material filtering down through the water column and compare it to sediments on the ocean floor. It was here that she truly discovered her affinity for coordinating complex projects and fitting the pieces together. Read an interview with Margaret. Get more info on Margaret's background. See images of Margaret at work. See Margaret's typical work week. Other sites related to Margaret's career.